Today at the Planning Committee the draft Auckland Plan Refresh will be approved to go out for consultation next year. The Auckland Plan refresh is a mandatory review of the Auckland Plan that went operative in 2012 top update it to reflect the current circumstances of Auckland. Since the Auckland Plan went live in 2012 things like the City Rail Link progressed and the master planning document – The Auckland Unitary Plan going operative so our Auckland Spatial Plan (the full name of the Auckland Plan) needs a bit of a refresh to match what is going on now. You can see the full Auckland Plan Refresh inside the Planning Committee Agenda at the bottom of this post. To approve the draft Auckland Plan for formal public consultation. This report seeks approval of the draft Auckland Plan (Attachment B) for formal public consultation which commences on 28 February 2017. The draft Auckland Plan has been developed over the course of 2017 under the direction of the Planning Committee. It has been informed through two phases of engagement with our partners and stakeholders. An integrated spatial plan, it sets a 30 year direction and addresses the key issues facing Auckland and Aucklanders. This is done through six outcomes that integrate social, economic, environmental and cultural objectives. As a spatial plan, providing direction on Auckland’s future development, how and where communities form and how infrastructure may be provided to support them to prosper, is critically important to our ability to plan for the future. The draft plan therefore also contains Auckland’s Development Strategy which sets out where and when development is expected to occur and where investment in infrastructure needs to be made to meet the significant growth that is anticipated. The draft plan includes maps that identify a range of infrastructure investments required across 30 years. This gives infrastructure funders and providers a basis from which to do their own planning. The first decade of growth and investment is understandably more certain than the following two decades. Monitoring actual on-the-ground growth and development is therefore essential so that informed adjustments can be made as is needed. Measuring progress is fundamental to successful implementation. The draft plan includes 33 measures which will provide an ongoing evidence base for aligning implementation and the regulatory plans and funding programmes of Auckland Council and other stakeholders. The refreshed Auckland Plan is digital which will enable the plan to reflect updated data and evidence more easily and therefore remain relevant over time. The digital plan will be the primary platform for formal public consultation. This report also seeks approval of theDraft Auckland Plan: Overview (Attachment D). This document provides a summary of the draft plan and will be used to support consultation. The Planning Committee has previously agreed to a joint consultation process for the Auckland Plan and 10-year Budget 2018-28. The consultation document, including specific questions, will be approved by the Governing Body on 7 February 2018. Public consultation runs from 28 February to 28 March 2018.
a) approve the draft Auckland Plan for public consultation, commencing on 28 February 2018, as shown in Attachments B and C of the agenda report. 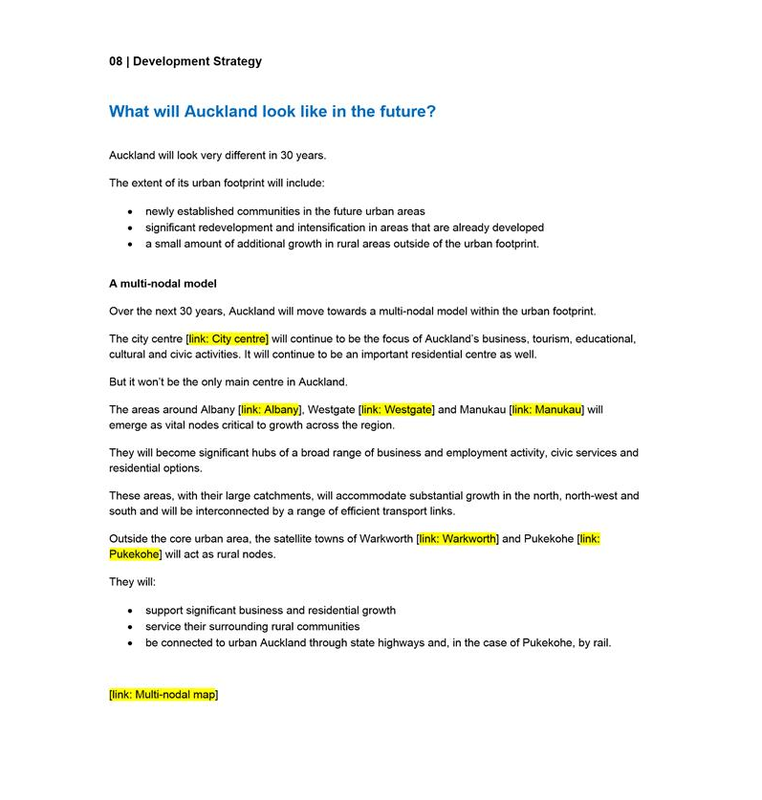 b) approve the Draft Auckland Plan: Overview document, which will be used to support consultation, as shown in Attachment D of the agenda report. c) recommend to the Governing Body that there is a question for each outcome and for the Development Strategy in the joint Auckland Plan and 10-year Budget consultation document. d) thank stakeholders for their involvement and feedback in the development of the draft Auckland Plan and that this be communicated. e) extend the existing delegation of authority to the Chair of the Planning Committee, the Deputy Mayor, the Chair of the Environment and Community Committee, the Chair of the Finance and Performance Committee, and a member of the Independent Māori Statutory Board; to review and approve any final changes and corrections to the draft Auckland Plan for consultation and the Overview document, including visual material under development as part of the digital Auckland Plan; and to review the consultation questions prior to approval by the Governing Body. Of note and probably significant note is that the Auckland Plan Refresh is looking at a multi-nodal approach to Auckland’s development strategy. This is compared to in the past where focus was around the City Centre then you had the Metropolitan Centres under that, then the Town and Local Centres and along the way industry might be mentioned – but essentially a single node was the name of the game. 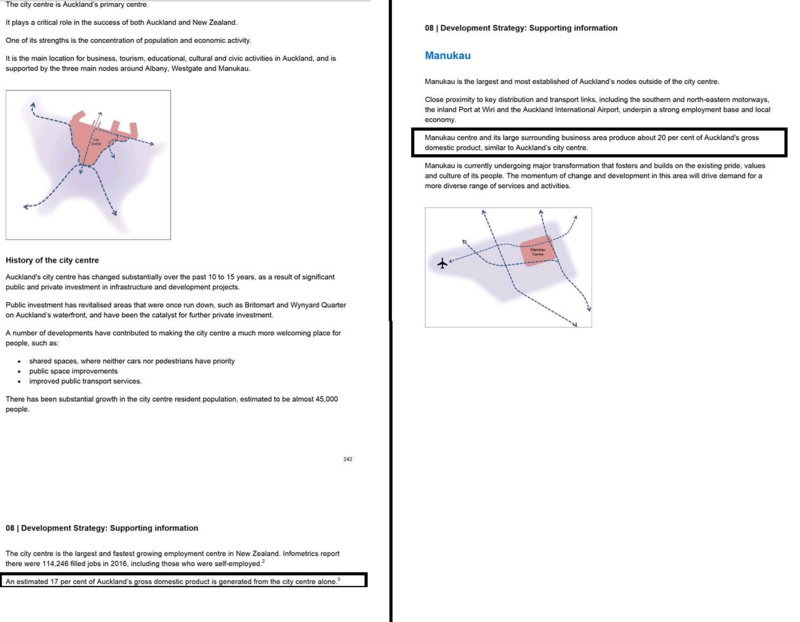 Albany and Manukau have been included in material before to be considered nodes or Primary Centres in the first Auckland Unleashed document which would become the Auckland Plan in 2012. Now someone has fluffed the GDP numbers but for now we will stick with the 17% and 20% GDP figure for now. Why? Share power in terms of output with the City Centre on commerce and services and Manukau with its industrial complexes. Both underpin strong employment bases and local economies with effects beyond their boundaries. Fluffed GDP numbers aside it does demonstrate the importance Manukau is as the largest and most established node outside the City Centre itself. Along with Albany and Westgate Manukau supports the City Centre rather than competes against it. 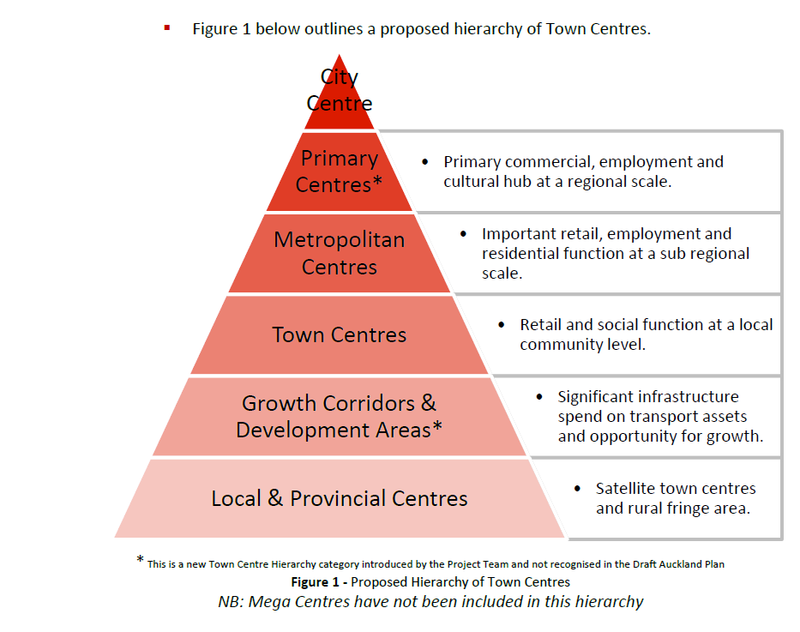 This multi modal development strategy is very reminiscent of my Super Metropolitan Centre concept I tried to introduce into the Unitary Plan three years ago. In any case will be interesting to see how the Committee handles the Refresh today and how it will look when it comes out for consultation next year.